Infamous: Second Son is Sucker Punch’s third entry in its Infamous series. A new protagonist drives the game’s changes from previous entries. Second Son improves on the core gameplay of its predecessors but fails to grow significantly. The protagonist of the first two Infamous games was Cole McGrath, a bike courier who accidentally gained electric powers. Most of Infamous’ fun came from rocketing around the open cities, unlocking new abilities and generally causing havoc on criminals and innocent people. Second Son’s major development on this formula is Delsin, who is Cole’s replacement as protagonist. Delsin has the ability to absorb other people’s powers. This means that instead of being limited to one power set, Delsin has multiple ones he can switch between. Sucker Punch did a good job of making each power feel different. Even though some moves basically overlap between the powers, such as a standard blast from the hands, they have different perks like firing rates or strength. The only real downside to having multiple powers lies in the decision to not allow access to all of them simultaneously. Players can only use one power set at a time. In order to switch, Delsin has to absorb the power from a source. While plenty of power sources scatter the landscape, it feels like an odd decision to give players a variety of powers to play with but restrict them to using only one at a time. This inflexibility aside, the powers are all fun to play and explore as Delsin runs wild through Seattle, the game’s location. As with the first two games, Second Son is an action sandbox title. Fights take place in a third person shooter style, with the camera hovering over Delsin’s shoulder as he fires blasts, bombs and rockets at his opponents. Seattle is painstakingly rendered with all the detail fans expect from the series. While unable to attest for virtual Seattle’s likeness to the real thing, I can assure that the former feels like a breathing, living city. Citizens lean against buildings on a smoke break or whip out their phones to take pictures of Delsin’s heroics. Or his villainy. Second Son continues Infamous’ tradition of utilizing a moral system. It also continues to be baffling in its simplicity. There are only two sides to the system: essentially, Hero or Villain. The more Delsin heals civilians or kills drug dealers, the more he progresses to becoming a Hero. If he kills said civilians and blows up a few annoying street performers, then he becomes well on his way to attaining Villain-hood. Abilities can only be unlocked by progressing one way or the other down the morality system, and a few of them are exclusive to Hero or Villain. The problem with the morality system is that everything is presented to the player as being heroic or villainous. There are points in the story where it forces the player to decide between one action or another, and each is clearly labelled as being good or bad. It is a highly simplistic view on the philosophy of morality to the point where it simply feels like a gameplay excuse for withholding certain abilities. 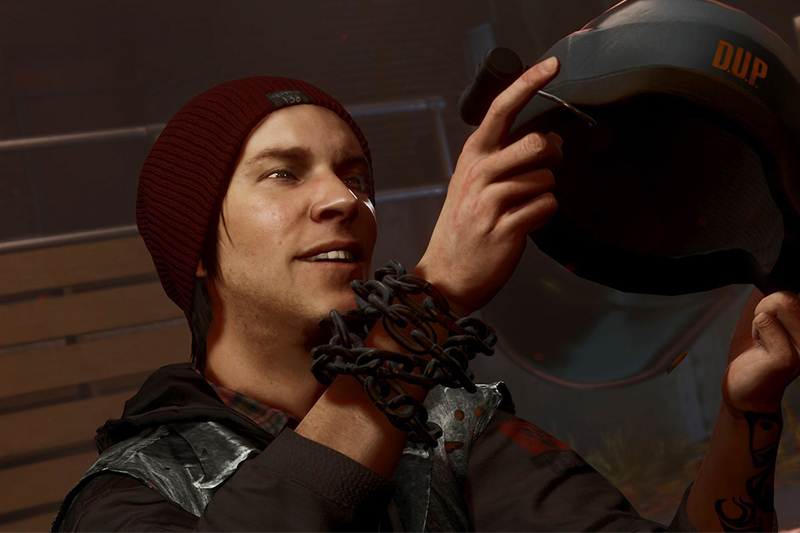 Whether the player decides to make him a Hero or Villain, Delsin is a marked improvement over Cole in the character department. Delsin is an Akomish Native American who falls squarely under the “young person trying to find who he is” stereotype. It is a fairly common archetype in superhero stories. But Delsin manages to have something Cole never really achieved: personality. The reckless rebel, Delsin quickly accepts his new powers to fight a repressive government. The flaw with the character is the tendency for him to err on the side of being annoying. Infamous: Second Son is a minor evolution, but it at least takes a step in the right direction. Multiple powers and better writing has made Second Son the best in the series.